Each month we’re featuring a member of the Rose Foundation community. We hope that through these interviews, you get to know a little more about the dynamic people who make the Rose Foundation’s work possible. You are a part of the Rose Foundation community and we want to tell your story too! If you want to be featured in an upcoming newsletter, let us know by contacting us. Mike Herz (retired) founded San Francisco Baykeeper in 1989, an organization dedicated using clean water laws and science to safeguard Bay Area communities and habitats. Since Mike first reached out to the Rose Foundation with a request to manage settlement funds in 1994, Baykeeper has continued to direct settlement funds to the Rose Foundation for distribution to local environmental groups. In addition to supporting our work as a loyal donor, Mike remains an important part of the Rose Foundation community. 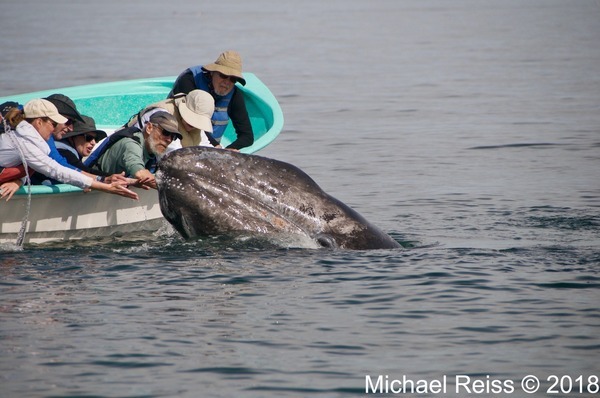 to chance to touch his favorite animal, the California gray whale. 1. What brought you to the Rose Foundation? I’ve known and worked with Rose Foundation co-founders Jill and Tim since we all were involved with Citizens for a Better Environment, years before they started the Rose Foundation. Their environmental justice perspective has always impressed me, so after our San Francisco Baykeeper program began generating significant settlement funds from successful lawsuits against San Francisco Bay polluters it was only natural that we directed resulting mitigation funds to the Rose Foundation for distribution to deserving local environmental groups. To date those funds exceed $3 million dollars. 2. What inspires you most about the Rose Foundation? The way in which they have inspired young people, especially those from disadvantaged communities who are not generally represented in the environmental movement, but are deeply committed to work on climate issues. 3. What are you up to in your spare time? Especially during the spring, summer, and fall, I spend much of my time in, on, and around water – the protection of which has been my life for the past 40 years. Sailing, kayaking, and standup paddling on Maine’s rivers and cruising the world’s oceans seem to demand increasing amounts of my time. 4. What is your favorite animal? My favorite animal is the California gray whale. After many years of taking people out whale-watching as a way to get their attention about the need to protect oceans, I finally got to visit the “friendly” newborn calves in the lagoons of Baja and to actually pet several last winter! This entry was posted in News & Features.